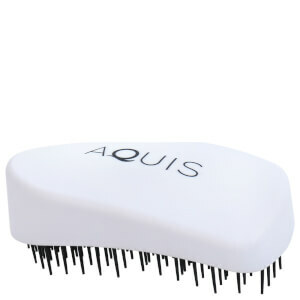 Minimise effort and damage when drying your hair with the Aquis Lisse Luxe Long Hair Towel in 'Stormy Sky'; a 25% lengthier version of the original to accommodate for longer hair types. Designed to minimise friction and breakage during the drying process (when hair is wet and vulnerable), the ultra-absorbent hair towel is woven from ultra-fine fibres (thinner than silk) and utilises AQUITEX drying technology which expertly wicks away water 5x faster than cotton to protect your tresses. Wet hair is prone to breakage and stress; to help combat this, the friction-free fabric gently dries without rubbing to minimise frizz and snapping. Reducing drying time by 50%, the innovative towel will not only effectively dry the hair, but prep and prime it for effortless styling. It helps restore strength, smoothness and shine while prolonging colour vibrancy for healthy-looking locks. Simply wrap and tuck around your hair after showering for hands-free drying. Ideal for longer hair that's curly, fine, ageing or prone to damage. Use at home, the gym or travelling.